Surprise! I am posting more than one post per week! I know I have been busy and not been able to post more than one post on my blog. Life has slowed down a bit this week and so I thought I will make a post today. But next week I have more to share. 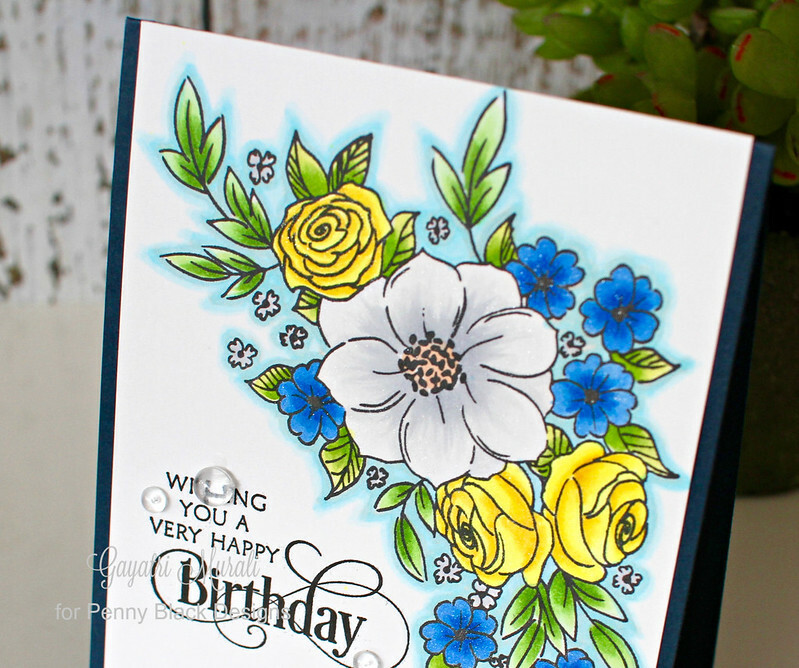 I have a card using new release stamp set from Penny Black to share with you today. 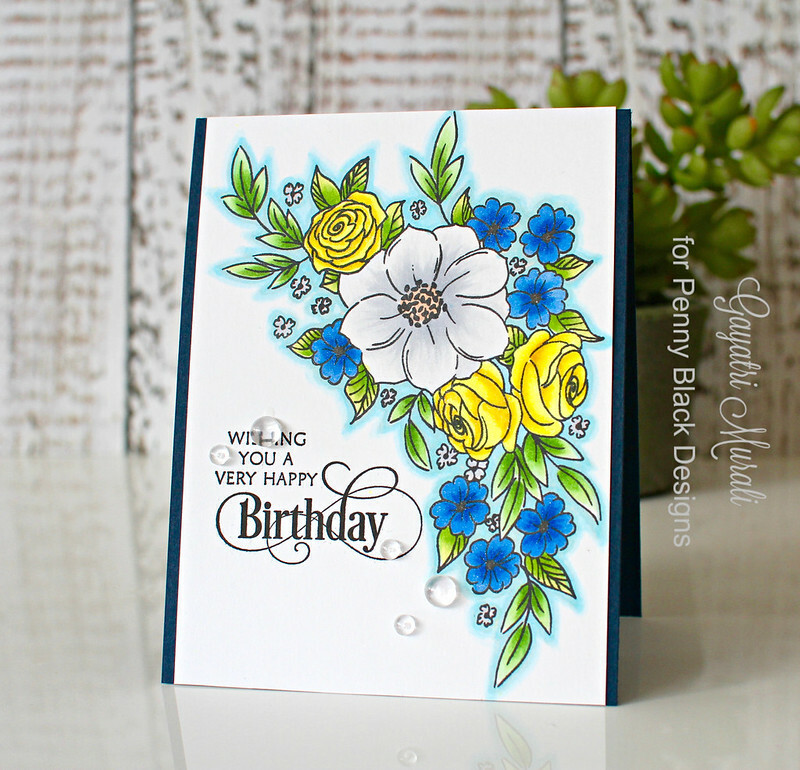 I love this new cling stamp set called Flower Cascade. So pretty and I straight away wanted to colour the image. So I stamped on white card panel and coloured the image with copic markers. This is my new favourite colour combination. Ink Blue, light green and yellow with neutral. I also brushed sparkle on the flowers. I stamped the sentiment from Special Thoughts stamp set. Then trimmed the panel to 4″x 5.50″ and adhered on an ink blue card base. I finished the card with clear droplets from Pretty Pink Posh. Here is what happened. The clear droplet did not dry and it moved when I took the photo. I didn’t realise until I was blogging. So I will leave it as it. Things like this happens especially when one is in hurry! Hope you like my card. 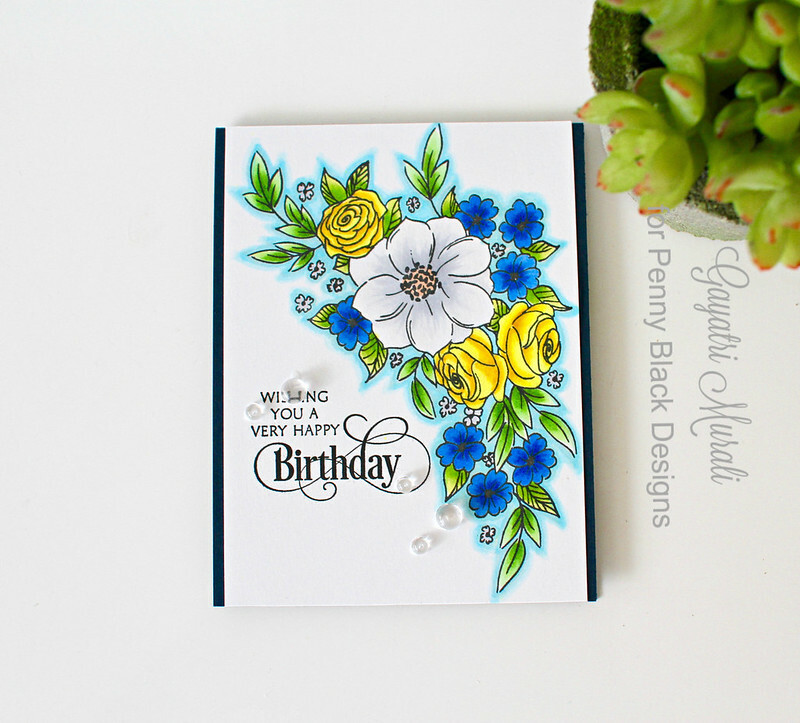 All the new release from Penny Black are available for purchase from Penny Black Store. Absolutely beautiful Gayatri, love the colours you chose! this is simply gorgeous Gayatri. I really love the colours you chose for this one. Oh, this is GORGEOUS!! Love!